Find device-specific support and online tools for your Lucid3 by LG. An interactive guide to setting up your Facebook account on your Lucid3 by LG. An interactive guide for how to log out of Facebook on your Lucid3 by LG. An interactive guide to posting a Facebook status update using your Lucid3 by LG. Here's how to remove or delete apps if your Lucid 3 is unresponsive, freezes or an app won't open. Here's how to turn pre-installed apps on your Lucid 3 on or off. To view or close recently used apps on your Lucid 3, view this info. Discover how to search your phone or the Internet with Google Now on your Lucid3 by LG. Learn how to use Google Now on your Lucid3 by LG. A step-by-step guide for using voice commands in Google Now™ on your Lucid3 by LG. A step-by-step guide for downloading an app or widget from Google Play™ Store on your Lucid3 by LG. Learn how to uninstall an app or widget from your Lucid3 by LG. Learn how to nearby places by category with Google Maps™ on your Lucid3 by LG. Learn how to view different map layers, such as current traffic and transit lines, with Google Maps on your Lucid3 by LG. Learn how to get voice-guided directions using Google Maps on your Lucid3 by LG. An interactive guide for writing and drawing on screenshots using QuickMemo on your Lucid3 by LG. Learn how to use Smartshare Beam to wirelessly share content between other LG devices and your Lucid3 by LG. An interactive guide for setting up your Twitter account on your Lucid3 by LG. Learn how to tweet on Twitter® using your Lucid3 by LG. Learn how to back up contacts with Verizon Cloud on your Lucid3 by LG. Discover how to back up your photos, videos, music and documents with Verizon Cloud on your Lucid3 by LG. An interactive guide on how to download files from Verizon Cloud onto your Lucid3 by LG. An interactive guide on how to set up a Verizon Cloud account for backing up contacts and content on your Lucid3 by LG. 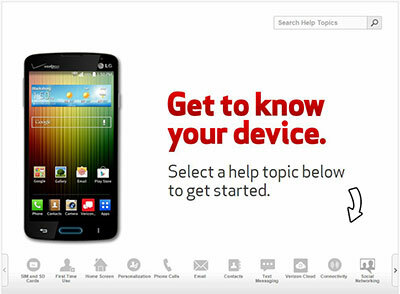 An interactive guide on how to get more Verizon Cloud storage using your Lucid3 by LG. A visual guide on how to see current traffic or a satellite view in VZ Navigator® on your Lucid3 by LG. A visual guide for exiting VZ Navigator on your Lucid3 by LG. Discover how to search for places by category with VZ Navigator® on your Lucid3 by LG.